But while the first news of the disaster was reported in all the media of Mexico, 70,000 workers went on strike in more than half of the maquiladoras in Matamoros, facing not only the bosses but, above all, overcoming and beating union control, overcoming employer and police repression and then extending the number of companies involved in a massive mobilization. The latest news that we hear speak of appeals to the formation of factory and strike committees to directly take up the fight and group together the maquilas. 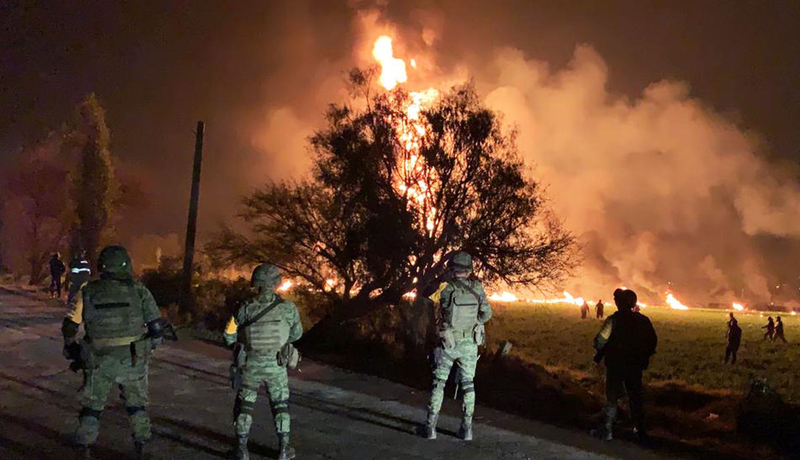 The "wildcat strike" of Matamoros, led by the most precarious workers is the most powerful mass strike we have seen in all the Americas in decades. Tlahuelilpan and Matamoros show the two paths we can follow. In Mexico, in the Americas and in the world. On one path, we are cannon fodder for the internal battles of bourgeois interests, consumable and dispensable cannon fodder. On the other hand, Matamoros shows a working class capable of overcoming the union-police control, self-organising and imposing their interests, interests that are not particular privileges or local demands, but universal affirmation of human needs, the seed of a new society.